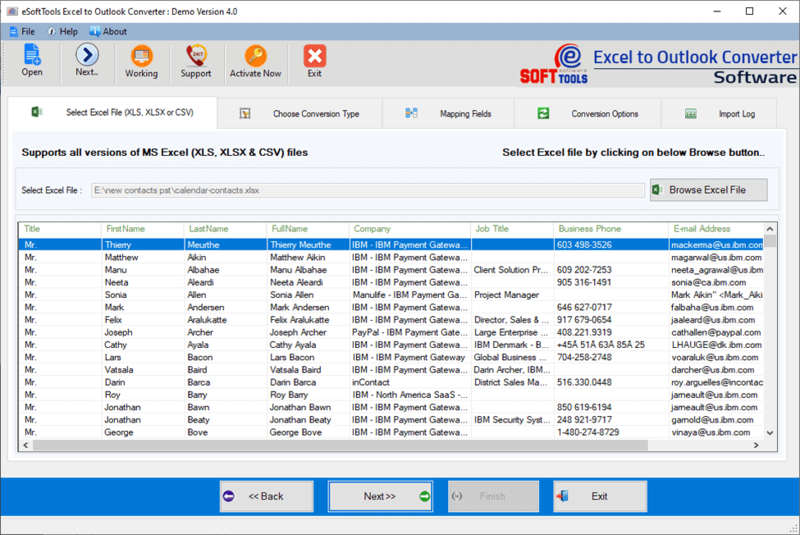 Multi-functional Excel Contacts Converter to Export Excel Contacts to Outlook, vCard & MSG files. 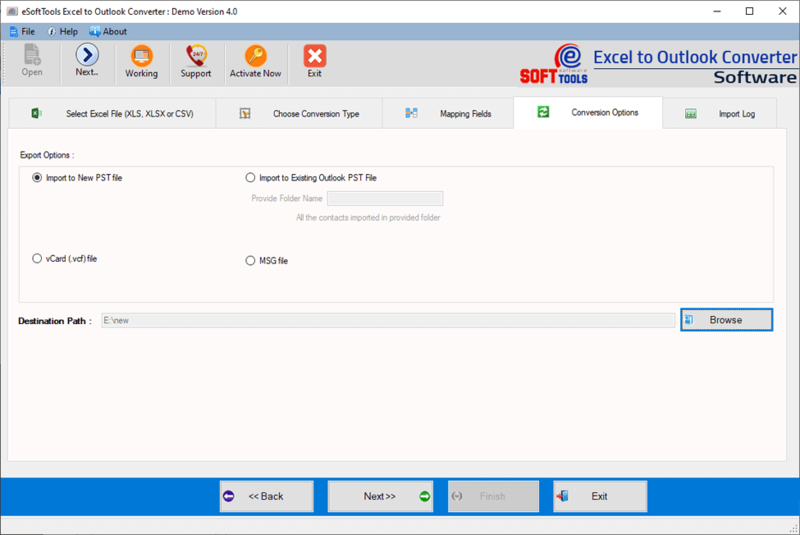 eSoftTools has Released state-of-the-art technology Excel Contacts to Outlook Converter Software that can be used to extract contacts from Excel (. 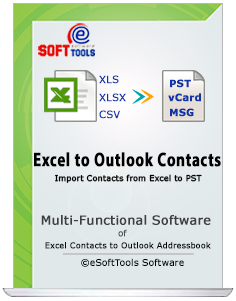 xls, .xlsx & .csv) and Convert Excel Contacts to PST Outlook. Software is capable to directly Import and Export bulk contacts of Excel file into Outlook Contacts without making changes in Excel contacts details. Perfectly Export Excel Contacts to vCard (*.vcf) file. Contacts Mapping Facility- Both automated and manual mapping feature enables to map contacts fields and perform accurate migration. NO Outlook Required- MS Outlook installation not required for Excel to Outlook Contacts Migration. Unicode PST Generate- Software import Excel contacts to PST unicode file that will helps to open by latest version of MS Outlook. MS Excel to PST conversion software smartly works on upto Excel 2019 files. Demo version excel to outlook pst conversion software, converts 10 contact items. Got 5-star rating from CNet Downloads to eSoftTools Excel to Outlook Contacts Conversion Tool for its faster loading excel files and scanning of individual contact items. 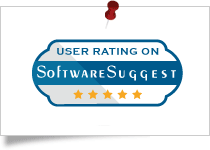 Got 100% user satisfaction and (8.0/10 rating) on overall migration process for eSoftTools Excel to Outlook Contacts by FinanceOnline for its best performance and 5 star rating by its users..
Software Suggest recommended eSoftTools Excel to PST Converter Software for more stability and powerful scanning of each contact item from Excel file algorithm. 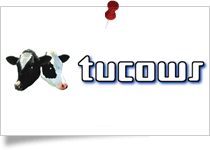 Got achivement to enroll eSoftTools Excel Contacts to PST software to Tucows! The most trustable download shareware website. Conversion data of Excel file to PST Contacts is become very easier for users because the eSoftTools that notorious for its marvellous migration and conversion application newly premeditated Excel to PST Converter Software that having easy & simple graphical user interface and have ability to perform secure conversion of Excel file contacts to PST File. Multi-tasking application successfully convert XLS, XLSX and CSV file to PST (Unicode) file with preserve all contacts fields. Excel to Outlook Contacts Converter is powerful utility supports all Excel file versions included latest- 2019, 2016, 2013, 2010 & below to perform conversion of their data into New Created PST. It never harms internal contact database and preserve each fields of contact during Excel to PST conversion. If you have PST File in which you can save Excel contacts data, consequently you can use this magnificent Excel to PST Converter Software that enable you to save Excel contacts data into existing Outlook PST file. Software also facilitates you to create your own folder in your pst file and import contacts from excel file. For downloading and installing Excel to PST Converter Software there no requirement of having outlook installation and configuration. Without MS Outlook you can Transfer Excel Contacts to Outlook PST file and in Existing PST file. It is well-matched with all MS Outlook versions included- 2019, 2016, 2013, 2010 and below versions. Export Excel to Outlook Contacts Software is fully automated that mean for using this you don’t need to take any technical knowledge, just install it and follow all provided instruction software will automatically import Excel contacts to outlook and it is totally safe and provides virus free migration process for saving database. Let see HOW IT WORKS and understand how to transfer excel contacts to outlook. Get the working Demo version - Download our trail free demo edition and import 10 contacts from excel file to PST, Existing PST, vCard and MSG files. Can I Convert XLSX Contacts to PST File using Software? Yes, Excel to PST Converter software supports both excel (.xls & .xlsx) format to Export and convert all the excel contacts to PST Contacts. Do I need to Install MS Outlook Application before installing Software for conversion? No, Outlook installation required. Without outlook install Excel to Outlook Contacts Software on your machine and start conversion functionality without facing difficulty. Can I Export Excel Contacts into Existing Outlook Profile? Yes, during conversion, the software provides you two option either you can export Excel contacts to existing outlook profile or create NEW PST for saving database. Will Software preview conversion process of Excel to PST File? Yes, Excel to PST Software will automatically generate preview of conversion process by which you can get the idea what contacts is going to convert into selected format. Can I mapping excel contacts to outlook attributes manually? 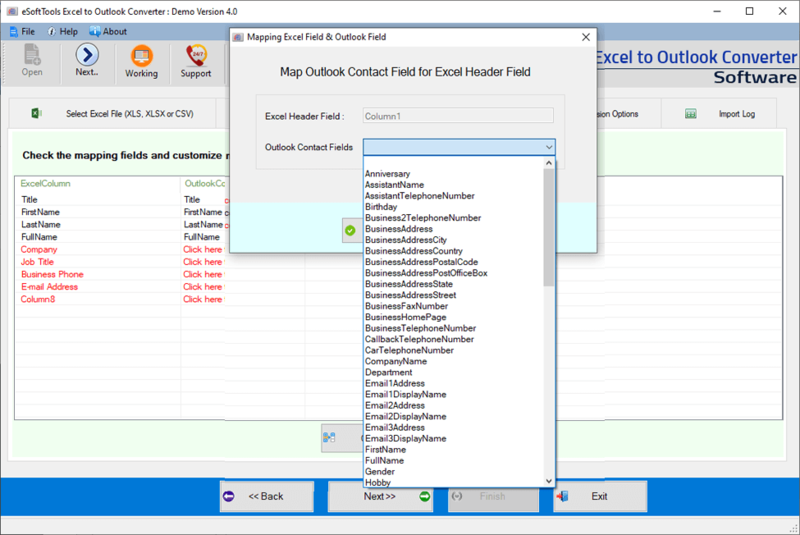 Yes, software supports both manually or automated, you can select any one option for mapping your Excel contacts to outlook contacts for conversion. Last day of weekends, I was looking for software to Convert contacts of my Excel file to MSG and vCard then I found eSoftTools Excel to PST Converter Software. I used this and got satisfaction result really its working performance was easy to apply and completely converted Excel file data to vCard or MSG... Thanks a lot.